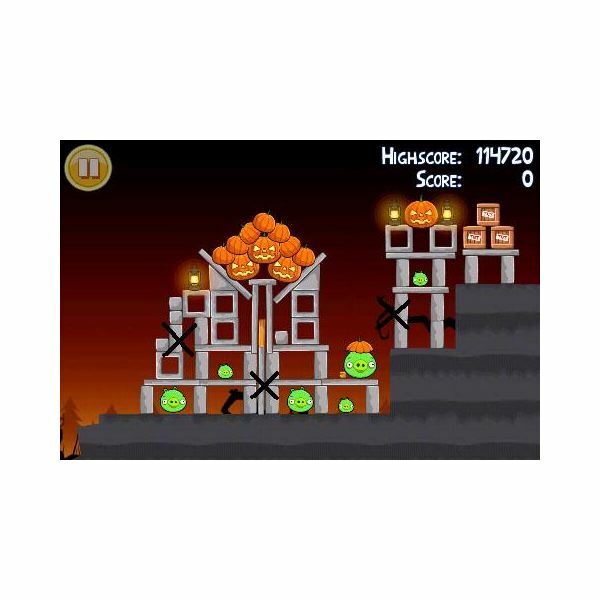 The Angry Birds Halloween edition comes in 3 different themes with 15 levels on each, here is the 3 star walkthrough for the first two themes with pictures to illustrate with an 'x' colour coded to match the bird colour, so if you get stuck just refer to the picture and aim your bird accordingly. Red Bird – To complete with one bird, aim it so that it hits the string holding the lantern to the left and everything will collapse. Red Bird – Aim high with your first bird, it needs to go straight over the pigs and hit the wall so whilst rolling back it will knock them all over one at a time. 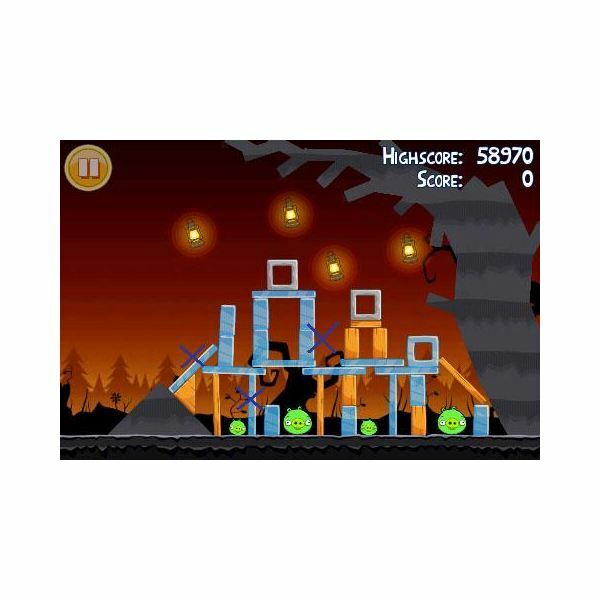 Blue Bird – Aim the bird to hit the lantern again in this level, just before it hits, for more impact tap the screen to release the extra birds and the structure will collapse. Blue Bird – Aim the second slightly above the last so it is aiming lower and tap the screen. The extra birds here will gain more points and the bird on top will fly over and kill the final pig. This level is by far the most unpredictable, playing it 20 odd times I didn't get the same score once, but when it works it will give you a 3 star rating, and a bird to spare to bring up your score even more. Blue Bird – Aim the first bird at the slanted opening of the cave, tapping the screen just before it hits. This will demolish much of the structure killing one of the pigs. Blue Bird – Aim this one at the corner of what is left for more points and to kill another pig. Blue Bird – This will be tricky but you'll need to aim the bird so that it lands just at the opening again killing the pig nearest and tap the screen just as it's about to land so they skid over and kill the final pig. Yellow Bird – Aim this one to take out the first leg of the structure below the cut out square, it will take out one bottom and two top pigs, leaving 3 more. Yellow Bird – This one needs to follow the same path as the first to take out the rest of the structure and kill the remaining pigs. Yellow Bird – Shoot the first bird high into the air to land in the middle of the structure to tumble the whole thing and kill the pigs. You'll be left with three birds at the end. 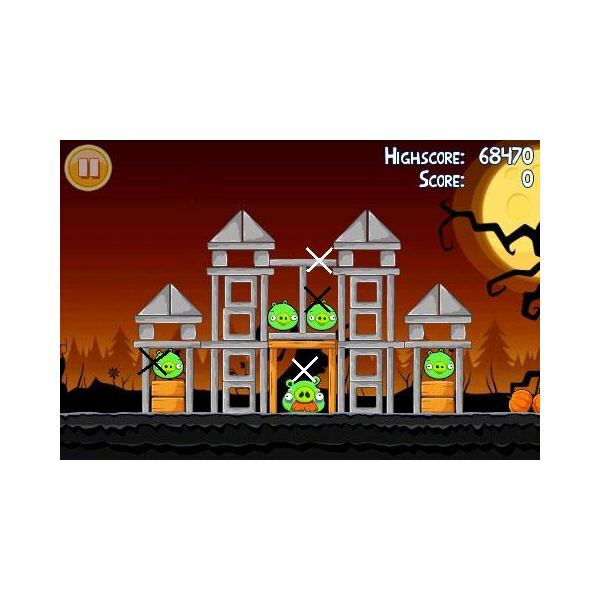 Black Bird – Shoot the first bird high to hit the pig in the middle, it will kill all but one pig. 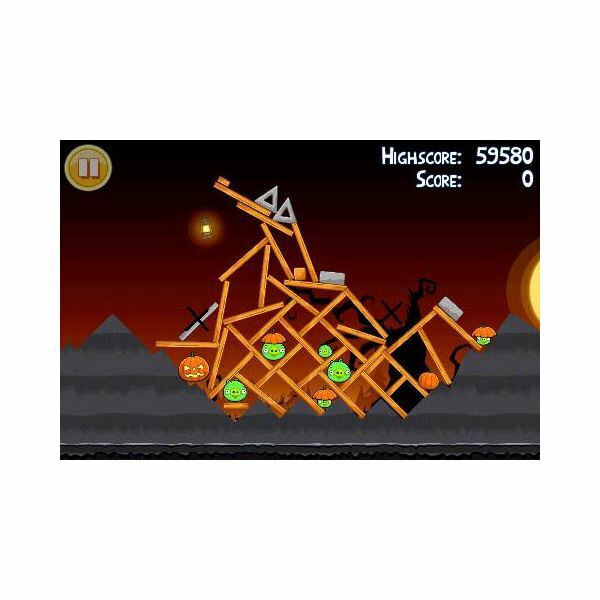 Black Bird – This one will need to be shot low, just aim for the remaining pig and if you get it in the first shot you'll have two birds to add on to your final score. This one does take a bit of practice! Black Bird – Firstly, aim the bird high to hit the second tower's left leg, this will collapse the whole side and leave 3 pigs left. 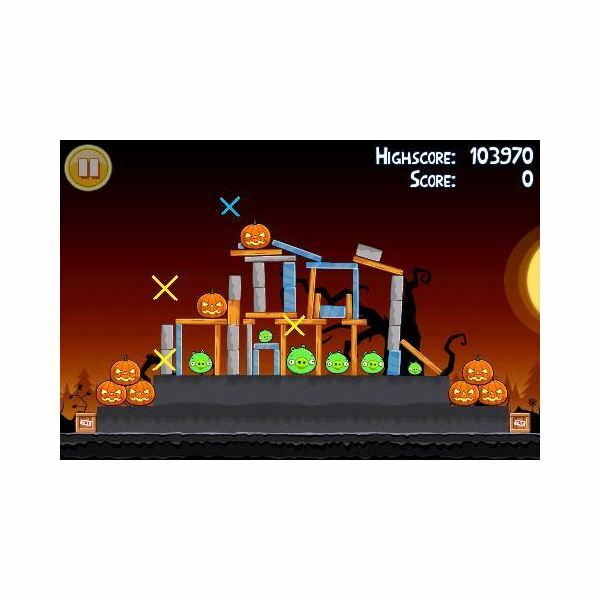 Black Bird – Now aim the second low towards the left side, collapsing the pumpkins and getting you a higher score. The two pigs to the left will also have been killed. 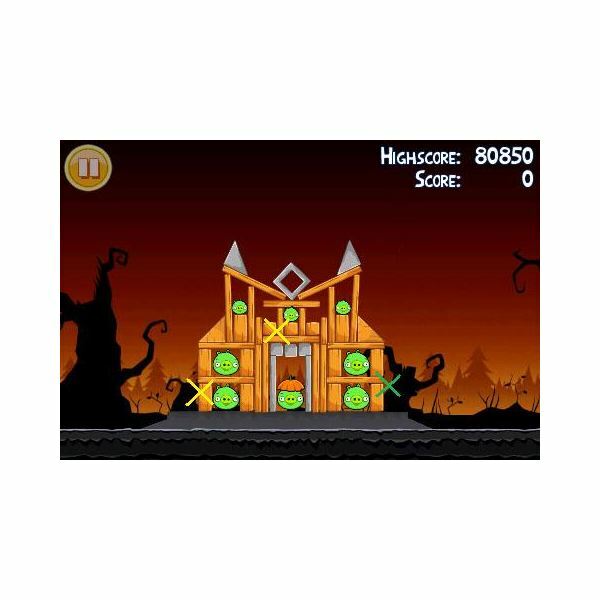 Black Bird – Use the last one to aim at the remaining pig, you should be able to get this close and kill it quite easily. This one will take that extra bit of practice but will give great results! White Bird – Aim it directly into the planks of wood, angle it correctly and this will knock it sideways, triggering everything to crumble and the pigs to be killed in the one shot. Yellow Bird – Aim this low, it must hit and go through the wooden slot just above the ground to the left side. It will collapse the wooden slots on that side. White Bird – The next bird to be fired off must be shot higher, we want this one to hit the wooden pole with the grey slats either side of it. On one occasion of testing this it resulted in the 3 star rating after killing off the final pigs, but more likely you'll have one left. Yellow Bird – If you have a pig left at this point aim it to kill. 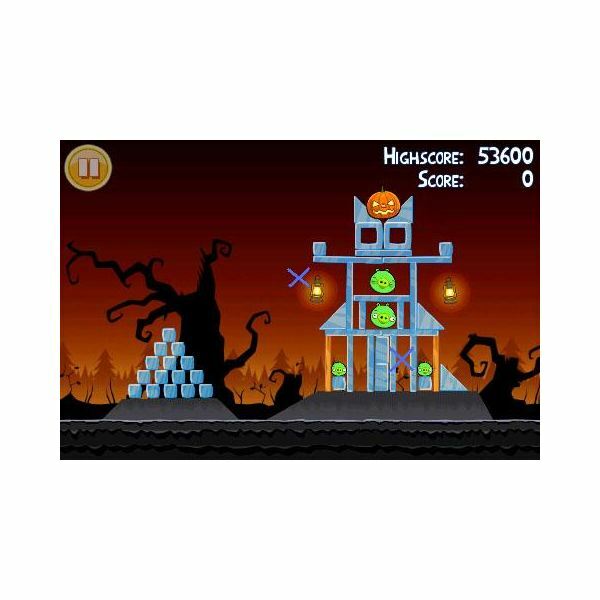 Large Red Bird – Shoot this bird just under the cut out grey square on the left, aim it at the topmost wooden plank to push it to the right, collapsing everything in on the pigs and killing them all. Large Red Bird – Aim this one high so it flies over the TNT box and hits the small pig square on. This will kill the pig and cause the bird to hit the tower from the right side, leaving the last pig. 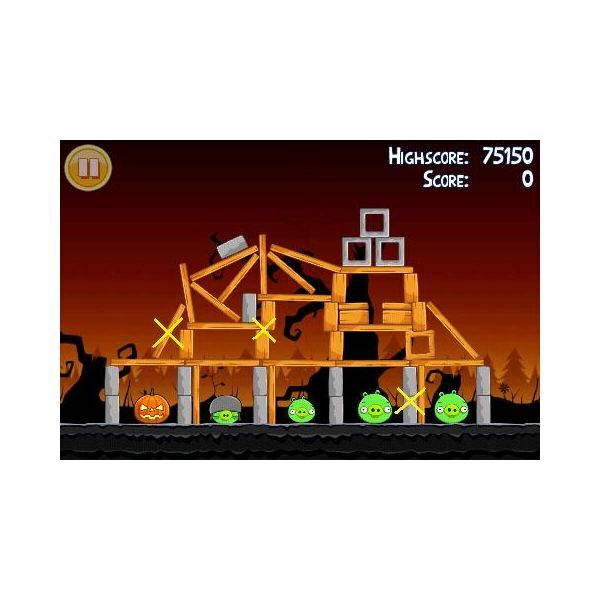 Large Red Bird – The last one needs to be aimed high to hit the TNT box and plummet down to kill the remaining pig. 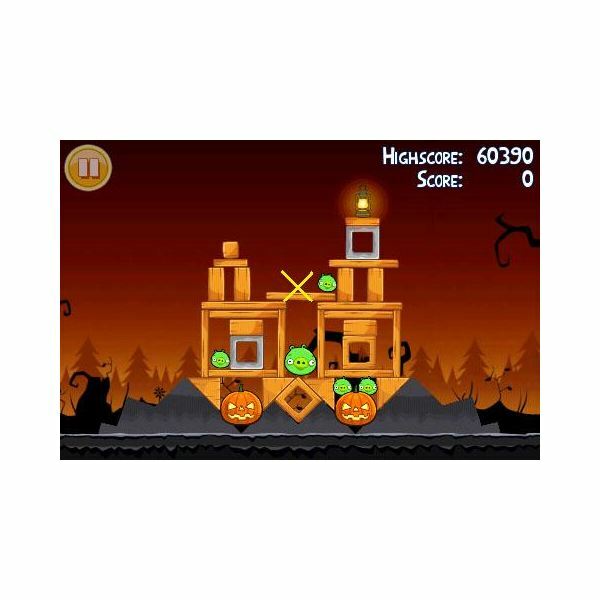 Green Bird – Shoot this high, may take some practice but you need to tap the screen when it looks to be going off screen so it turns and hits the right side just in the corner above the two cut out squares to kill the top pig. 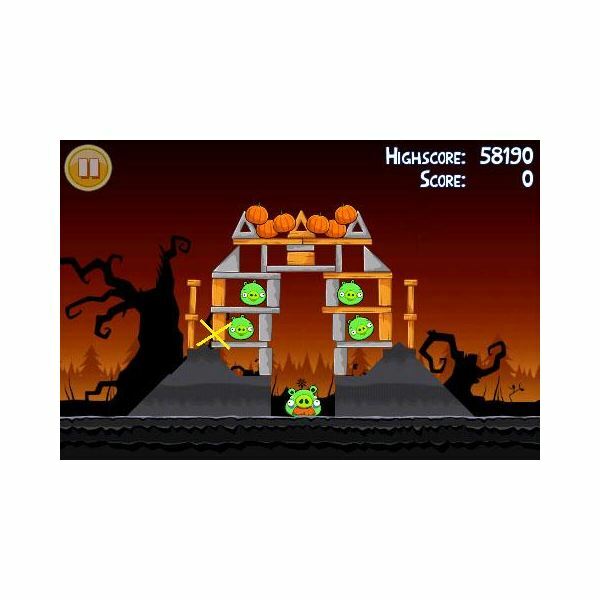 Green Bird – Aim this one on the same path, but tap the screen when it hits the last bird's curve and it will hit the structure further down killing another pig. Green Bird – In the same path again tap the screen just above where we did the last one, this will hit head on the last pigs. 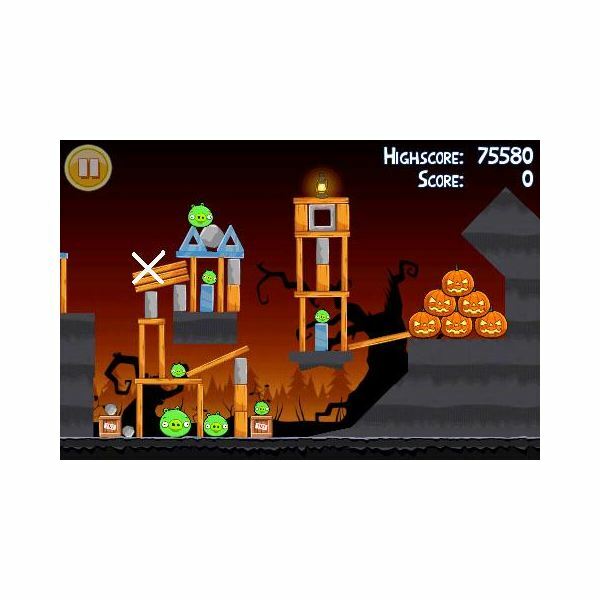 Yellow Bird – Aim this to hit the lower left wooden pole and tap the screen to propel to collapse the whole left side. Green Bird – Aim this quite low, it needs to just go over the top of the structure and tap when it touches the branch to the right in the background. It will turn around and demolish the rest of the left side. Yellow Bird – This just needs to hit the top of what is left of the structure to knock the wall and drop the brick on to the final pig. 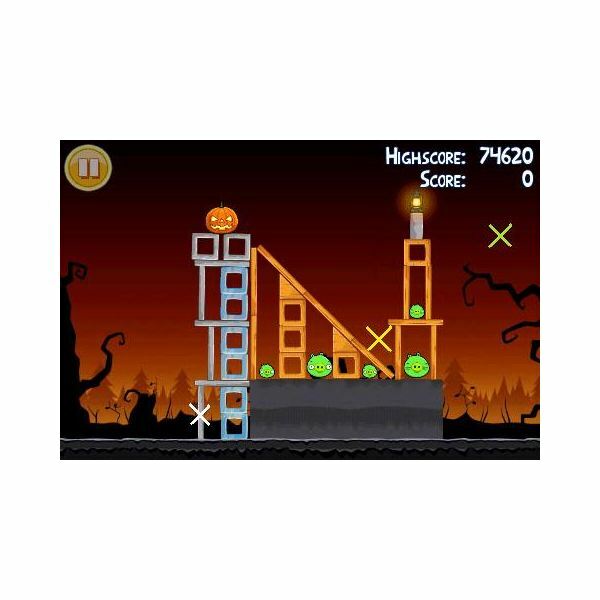 Green Bird – Aim this just high enough to go over the first tower and tap the screen so it hits the opposite side just over where the wooden beam is. This will leave the furthest four pigs. Blue Bird – Shoot this to aim for the middle pig but tap the screen as it's just past the first pig and it will multiply to hit the structures and kill the end two pigs. Yellow Bird – Aim the yellow bird to kill the middle pig in the same path as the last. Blue Bird – Aim this high so it goes to hit the remaining pig head on and tap the screen to ensure one hits. 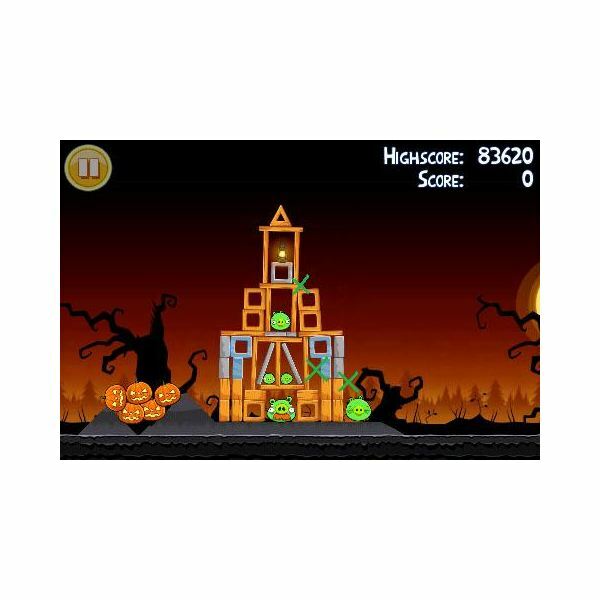 Go to page 3 to see the walkthrough for the Angry Birds Halloween theme 2. Large Red Bird – Aim this one just below the lantern, to hit the wooden beam. After a few seconds of rocking the structure should mostly collapse. Large Red Bird – Now this one needs to be aimed directly at the pig in the middle of the crumbled structure and go straight through killing that one and the last remaining one. 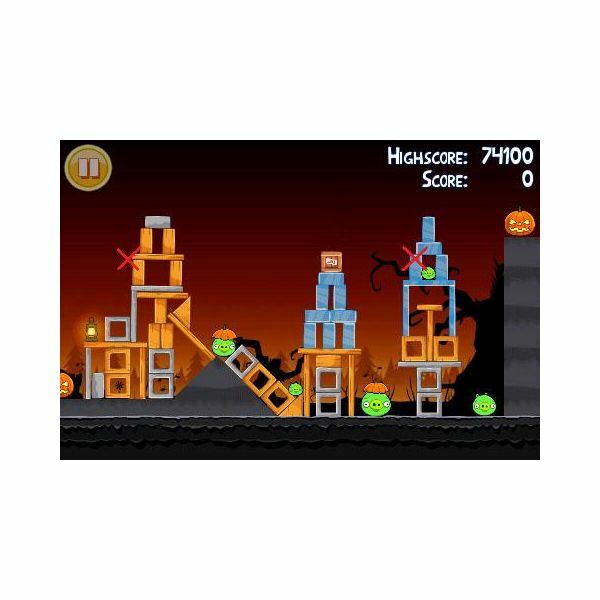 Black Bird – Shoot the black bird directly at the bottom nearest metal beam. This will go straight in and blow up the closest two pigs. 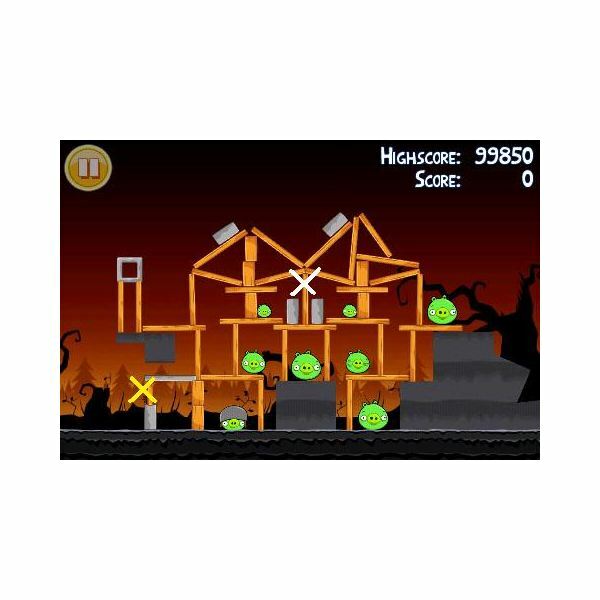 Yellow Bird – Simply aim this one at the remaining pig to go through the wooden beam protecting it. Yellow Bird – Aim the first bird to go through the bottom of the structure, as low down as you can causing it to wobble and fall down killing all of the pigs. Large White Bird – Aim this high as we want this one to drop directly on the pig on the top right hand side, just before it hits, however, tap the screen to do the most damage as the egg will damage below and the bird will crash into the wall. Black Bird – There should be just one pig left surrounded by grey plates, so shoot this to land next to it, it will crash through and explode. Yellow Bird – Aim this to hit the cut out square which will collapse some of the structure and kill a few pigs. 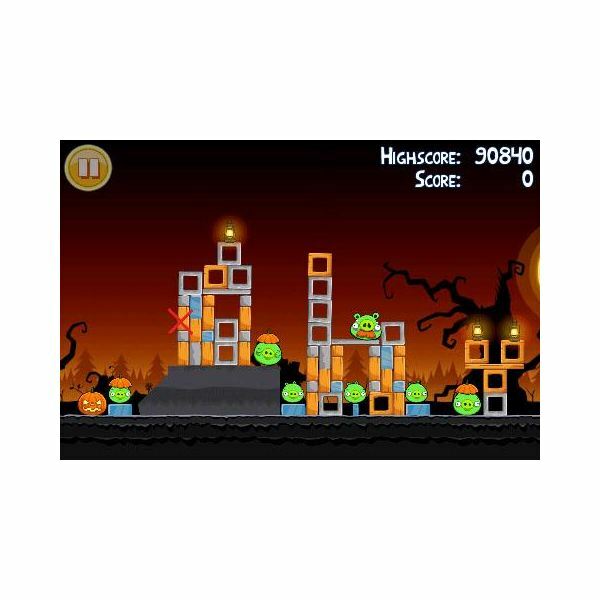 Yellow Bird – Follow the same path to hit the blue beam and collapse more of the structure. Yellow Bird – Following the same path and extra speed this bird should collapse what is left and kill the remaining pigs with birds to spare. 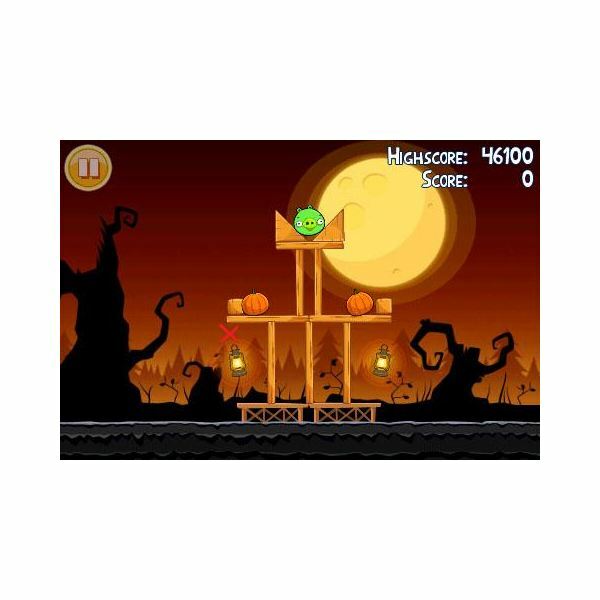 Yellow Bird – We want to aim the first bird at the wooden beam to tumble and kill the first pig. 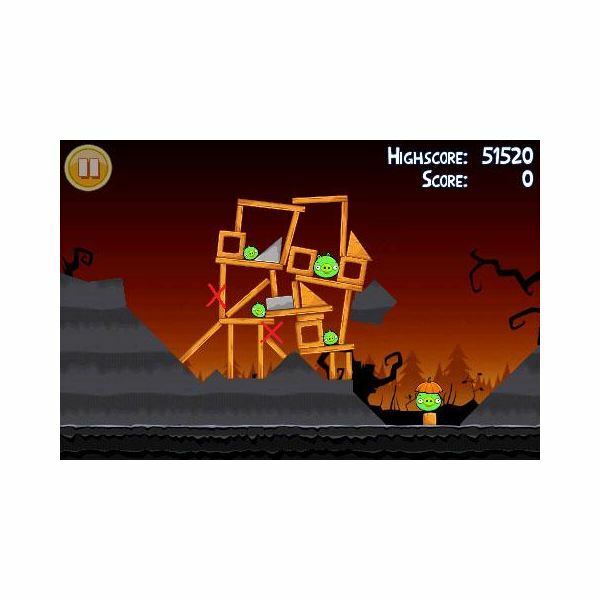 Yellow Bird – Aiming slightly higher, now aim for the two wooden beams resting on each other to kill the second pig. The structure will rock and fall at this point. White Bird – Fly this bird over the two remaining pigs and shoot its egg on the grey slab separating them and this will shatter and kill the final pigs. Blue Bird – Aim this towards the corner of the wooden triangle, tapping the screen before it hits so the birds attack the blue walls. Yellow Bird – This needs to follow the same path with increased speed to kill the closest pig. Black Bird – Shoot this at the same angle, with it being heavier it will shoot lower than the previous bird landing on the grey slat and killing the remaining pigs. White Bird – Aim this high as it must fly over the first tower and on to shoot the egg just before the second tower. Black Bird – Aim this high also, it must go directly down the hole we just created. White Bird – Fly this one over the first tower and drop the egg on to the large pig. Black Bird – This one needs to be aimed at the last remaining pig. Red Bird – Aim this towards the verticle wooden beam and it will snap, this can be done on one shot but mostly takes two shots so don't worry if you don't get it on the first. This will collapse the structure and kill all of the pigs in it. Red Bird – Aim this on the same path, it will push what is left of the rubble to kill the last pig. Black Bird – Aim high to hit the lowest point in the structure over on the right side. This should kill three of the pigs. Black Bird – Aim this to the grey plank on the left side, this will break and collapse the rest, killing all remaining pigs. 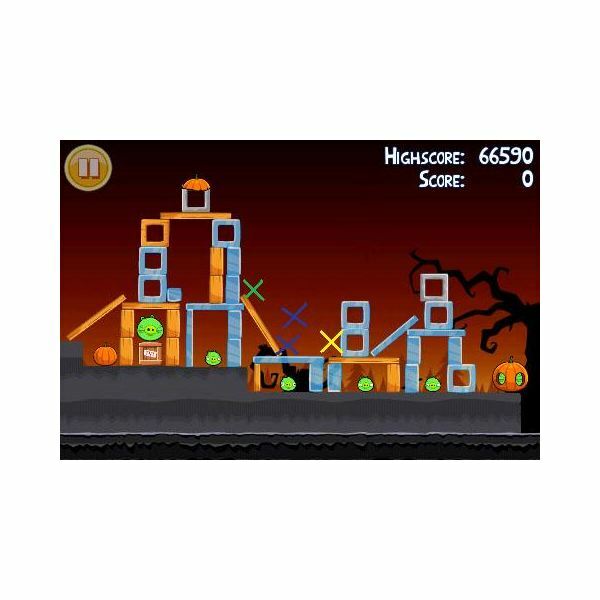 Blue Bird – Aim this high into the air, aiming specifically for the pumpkin at the top of the tower and tap the screen as it gets close so that the middle bird hits the pumpkin and one either side hits the structure knocking the grey slabs and destroying the pumpkins getting you more points. 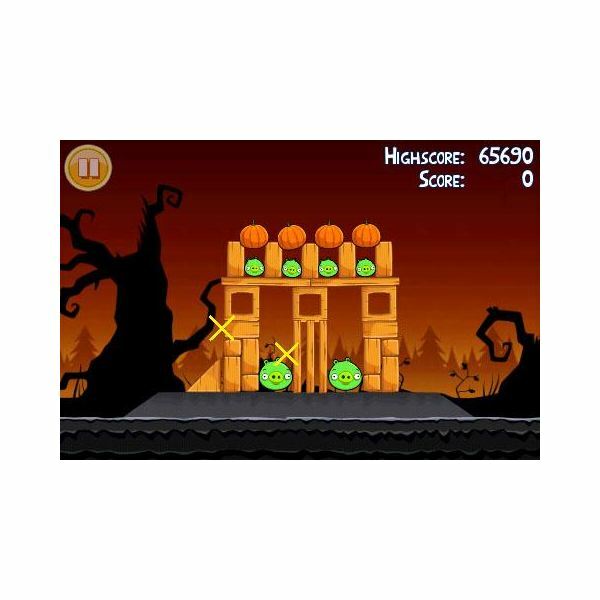 Yelow Bird – The yellow bird must hit the pumpkin lower down, this will tilt the beams. Yellow Bird – Aim this one low to hit the beam and kill the left most pig. Yellow bird – Aim this bird a bit higher and at the biggest pig, tap the screen to increase speed and it will hit the first and on to the last two. As with most of these, there's a few different ways to do this one, we've gone for the easiest but most effective. White Bird – Aim this to land in the corner of the bottom left step, just before it lands tap to launch the egg and this will destroy the step and leave the wooden beam vulnerable to attack, if the structure falls, skip the next step. 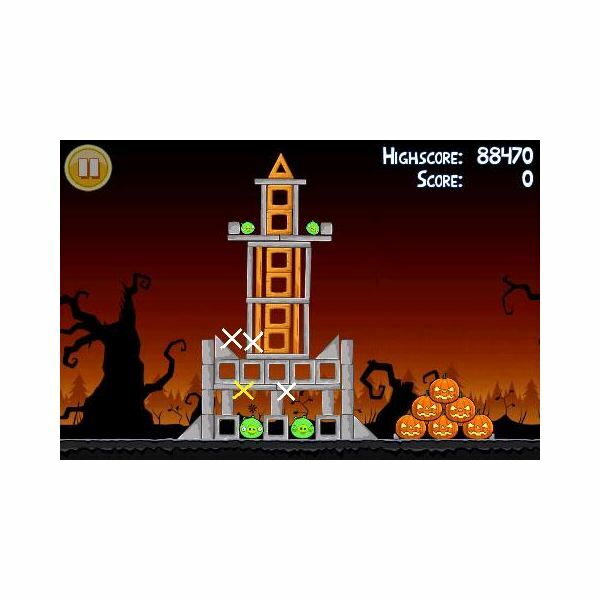 White Bird – This one needs to follow the same path and drop the egg just before it hits the wooden beam causing the tower to fall and the pumpkins to be destroyed. 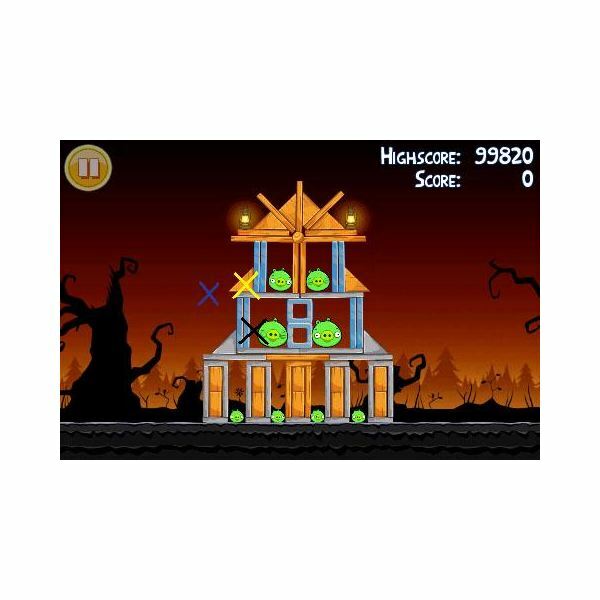 Yellow Bird – This one can follow the same path, it will hit the grey structure killing the bottom left pig. White Bird – Make this follow the same path and drop the egg on the corner before it hits to kill the last pig. 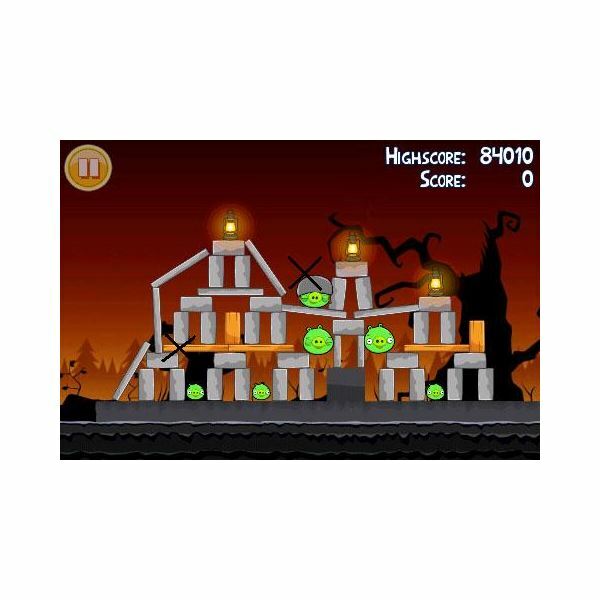 White Bird – Aim this one low to hit the bottom left grey beam causing the tower to fall. 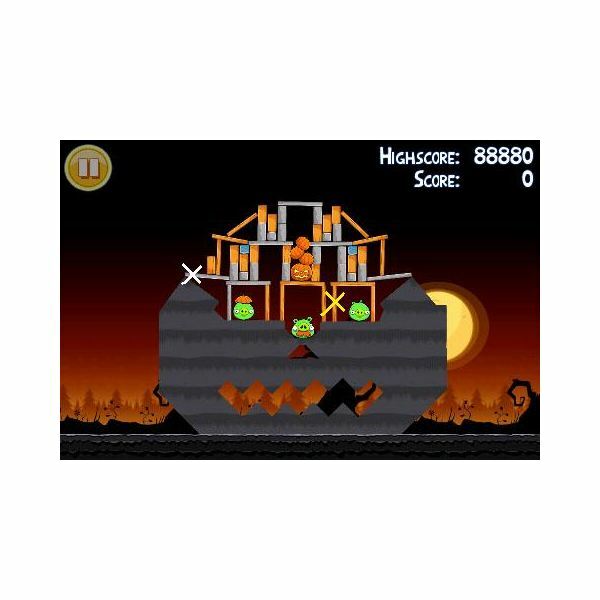 Yellow Bird – Shoot this high into the air, it must land in the corner at the bottom of the slope to knock down the far tower and kill the three closest birds. 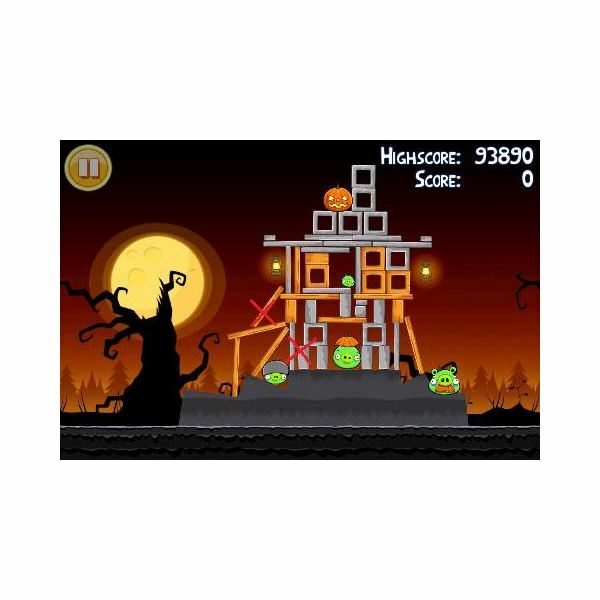 Green Bird – Aim this high to fly over the the structure and tap the screen when it gets above the branch in the background and it will spin around and destroy the rest of the structure and kill the last two pigs. White Bird – Aim this high but far to drop the egg on the bottom step to destroy and kill the three pigs closest to it. Yellow Bird – This needs to be aimed higher still, to land on the wooden triangle which should be resting on the outside of the structure to kill two more pigs, leaving one left. 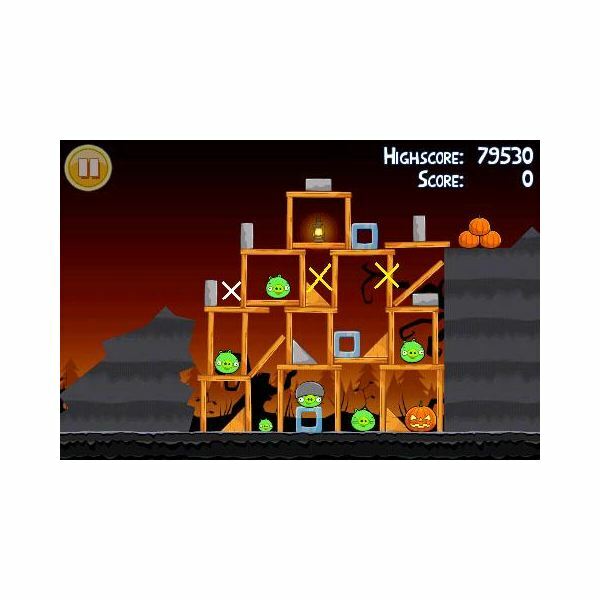 Yellow Bird – Aiming a little higher again, aim this bird up and to land on the vertical planks, this will tumble the rest and kill the remaining pig. 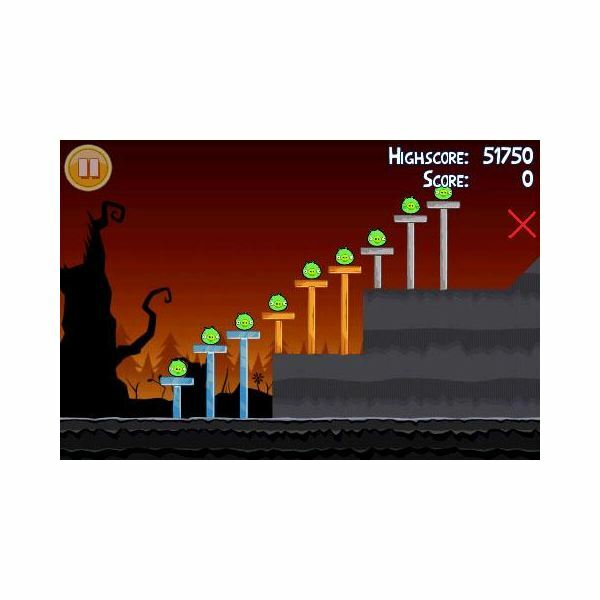 Red Bird – Shoot the first bird to hit the wall between the lanterns which will kill the closest pig. Yellow Bird – Following the same path, shoot the yellow bird, tapping to increase speed and this will land slightly higher killing the pig in front. 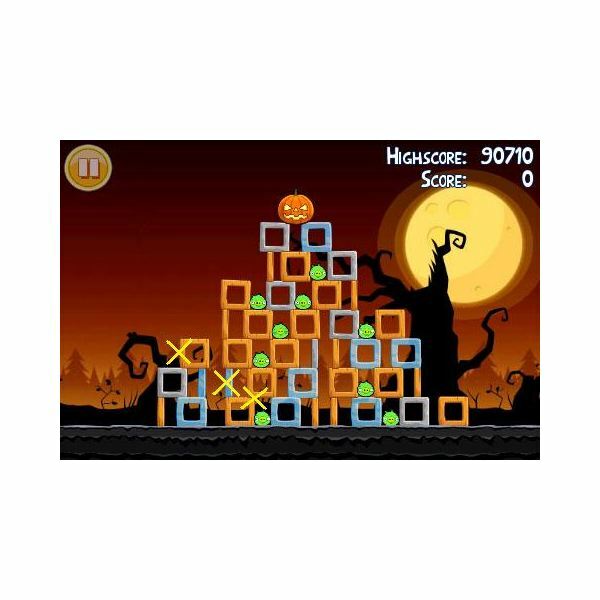 Large Red Bird – Again in the same path, shoot the large red bird which will go straight through and demolish the rest of the structure, killing the rest of the pigs and coming to rest after destroying the pumpkins. I hope this guide has been helpful in gaining the 3 star status in Angry Birds Seasons Halloween edition, there are various ways to complete the levels but this guide focuses on doing the most damage to gain those extra points! 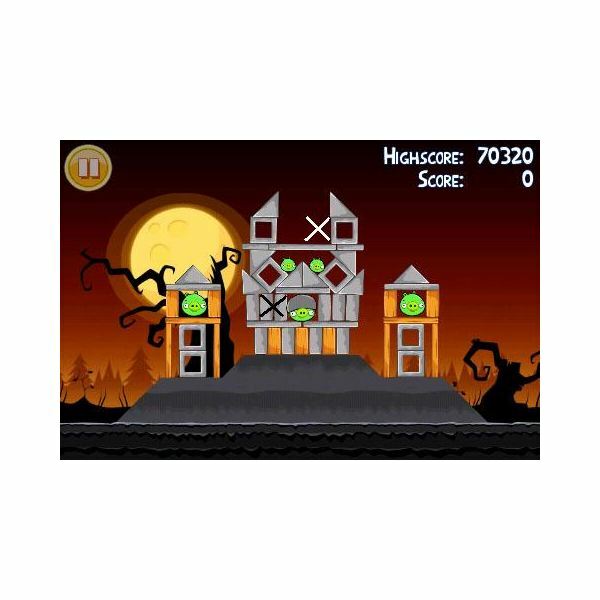 With the Angry Birds apps being in the top downloaded lists since its release, here is a walkthrough guide to the Seasons Halloween themes.